My other blog is currently undergoing redevelopment so I'll post this here for now. 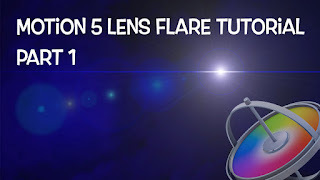 I downloaded Motion 5 a few months ago and one of the first projects I used it for required lens flare effects. Motion 5 only ships with a very simple, two-dimensional flare generator, so I had to find ways to make the desired effect myself. I muddled through, learning Motion 5 as I went, and ended up with something half-decent, but it was an impractical way to achieve it so I set about finding a better way. I banged my head against it for a couple of weeks and eventually, after several false but promising starts, I stumbled across Parameter Behaviours and unlocked the secret I'd been searching for. I just uploaded a video tutorial explaining the building blocks of this method and hope it proves useful for others trying to solve the same problem.